You have asked and CYP have delivered! Offering the same ground-breaking feature sets as their PUV-1082-4K22 Matrix, they are proud to announce the arrival of our new 6x8 and 4x6 variants, to suit installations with fewer displays. The PUV-662-4K22 features 6 HDMI inputs (all switchable) to 8 displays via 6 HDBaseT outputs and 2 independent HDMI outputs. Delivering 4K UHD video (4:2:0 @ 60Hz) up to 100m via a single Cat 5e/6/7 cable, and 4K HDR video at full 6G (4:4:4 @ 60Hz) on the HDMI outputs, the PUV-662-4K22 offers the full complement of HDBaseT features and the latest HDMI specifications. Along with its full audio matrix, it gives installers even greater flexibility when specifying the right matrix for the installation. Although featuring fewer inputs and outputs, the PUV-442-4K22 delivers the same level of versatility as the other matrices. Able to switch 6 HDMI inputs to 4 HDBaseT outputs and 2 independent HDMI outputs, the PUV-442-4K22 also includes the full audio matrix and completes the range. 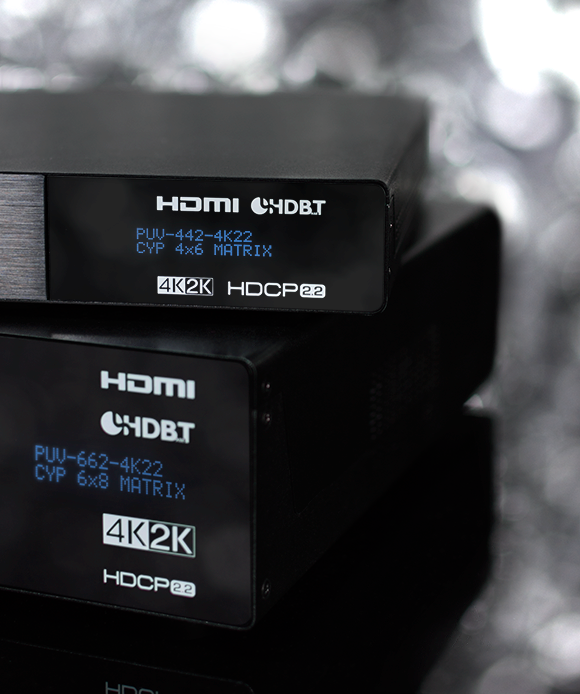 These new HDBaseT matrices are amongst the most feature-packed available on the market. When combined with CYP's unsurpassed product development and technical support, even the most complex of AV distribution systems can be catered for, regardless of the size! Slimline Receiver offering ‘full-fat’ features! Although CYP's latest matrices are full sized, the receivers certainly are not. Packaged in a new slimline casing, the PUV-1530RX Receiver features PoH (Power over HDBaseT) and HDCP 2.2 compliance. Not only will it accurately decode UHD video (HDR 4:2:0 @ 30Hz) and audio sent over HDBaseT up to 100m via a single run of Cat 5e/6/7 cable, its slim profile makes it particularly easy to install and hide behind modern thin flatscreen displays, making it one of the most discreet solutions available. Available and in stock now, please contact us for further information or to secure stock for upcoming installations.